Chronic obstructive pulmonary disease – called COPD for short – is a term used to refer to a group of chronic lung diseases related to poor airflow to and from the lungs. Most commonly, people with COPD have either emphysema or bronchitis, but asthma may be included as well. 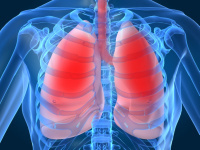 People with COPD have a higher than average risk of developing lung infections, such as pneumonia, which then puts them at higher risk for developing sepsis. In the United States, the major cause of COPD is tobacco smoke, followed by air pollution. Frequent infections and family history may also play a role. COPD may be a respiratory illness, but it can have a big effect on other parts of your life. People with severe COPD may have trouble eating a healthy diet, because shortness of breath can make it difficult to prepare meals and to eat the food that has been prepared. If you are not well nourished, you may be more susceptible to getting an infection. Shortness of breath may also reduce how much physical exercise you get, and moving around is a big part of staying healthy overall. As well, being short of breath or coughing a lot can make sleeping very difficult, resulting in fatigue, which leads to other difficulties.